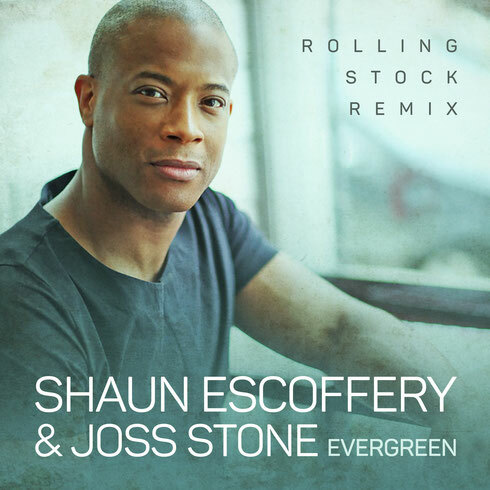 Taken from his current album smash 'Evergreen', hailed as album of the week on BBC Radio 2, Shaun Escoffery unleashes his duet with Joss Stone on the album title track. 'Evergreen' comes decorated with uplifting southern-soul grooves and Escoffery’s soulful tones are complemented by Grammy winning Stone’s sultry voice, which leaps freely into higher registers. Transporting this directly to the dancefloor is up and coming UK producer Rolling Stock, who has worked up a house music track teased with lush, melancholic synth washes, drizzled over a punchy bass groove. Shaun Escoffery made his chart debut as a singer with his very first album, released on the Oyster label in 2001, which yielded the singles ‘Space Rider’, the now club anthem ‘Days Like This’, and two more albums followed. After a seven-year break, Shaun returned the album ‘In The Red Room’ on Dome in 2014, co-written by Shaun with producer Gil Cang. All four singles were play-listed by BBC Radio 2 and entered the UK Airplay Top 50 chart. Shaun’s new album, ‘Evergreen’ (co-written and produced by Gil Cang), was released September 2016. The first single ‘When The Love Is Gone’ became a Top 30 UK Airplay chart entry and new tracks ‘Love Shine Down’ and ‘Ain’t No Time’ are enjoying strong airplay. Shaun is joined on the album by Joss Stone and Andreya Triana. 'Evergreen (Rolling Stock Remix)' is out now on Dome Records / Mvka.